Panasonic today announced the latest technology and feature updates to its flagship rugged notebook with the launch of the latest generation Toughbook CF-31 and its market leading semi-rugged notebook, the Toughbook CF-53, which offers mobile workers enhanced performance and flexibility. The Toughbook CF-31mk3, available in two different models (Standard and Performance), offers increased computing power, longer battery life and a range of enhanced management functionality and connectivity. Designed to access applications and data in the most extreme mobile computing environments, the CF-31 has become the fully rugged device of choice for utilities, emergency services and public safety. Whether working in adverse weather, wet conditions or a cramped work environment, the Toughbook CF-31 ensures that workers perform to their optimum at all times. Specifically designed for field-based professionals who need advanced graphic performance or access to mapping applications, the new Toughbook CF-31 Performance Model offers the ultimate combination of graphics delivery and supreme ruggedness. Powered by the 3rd generation Intel® Core™ i5-3360M vPro™ processor (2.8GHz, up to 3.5GHz with Intel® Turbo Boost Technology) with AMD Radeon™ HD 7750M switchable graphics, the top of the range performance model can switch between enhanced and integrated Intel® HD 4000 graphics performance to save power when on the move. The Standard Model uses the performance Intel® Core™ i5-3320M vPro™ (2.6GHz, up to 3.3GHz with Intel® Turbo Boost Technology) with Intel® HD 4000 graphics. As well as the new CPU, the CF-31 is also equipped with a low voltage DDR3L RAM module, using less power for more efficiency and a longer battery life. Hard Disk Drive capacity has been raised from 320GB to 500GB with 128GB or 256GB SSD options available. 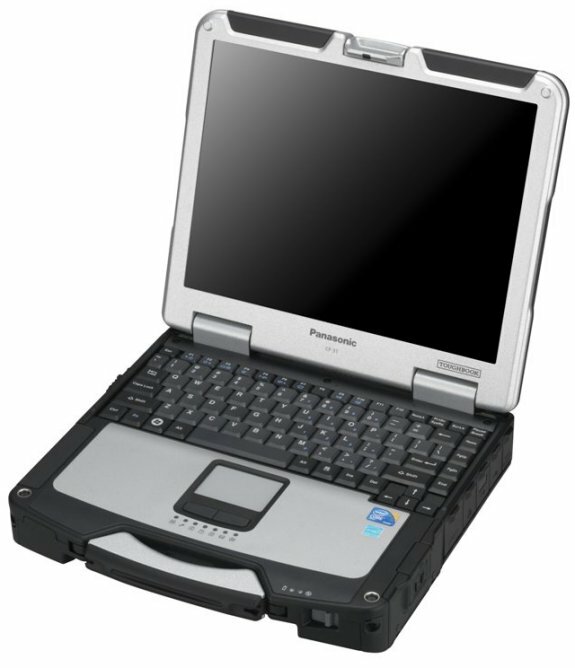 The latest Panasonic and Intel efficiencies combine to ensure the battery life of the Toughbook CF-31 has been extended by an hour, allowing mobile workers to work for up to 14.5 hours (MobileMarkTM 2007, 60cd/m²) running on Windows® 7 without a recharge. In addition, the CF-31 allows for an optional secondary battery pack to be attached via the multimedia bay in the Standard Model. This addition allows users to hot swap the main battery, ensuring the unit can be operated around the clock by revolving the batteries or simply extending the battery life of the unit by up to 6.5 hours* to a total of 21 hours*. The ability to see data and applications on screen in bright sunlight is essential for field workers. The CF-31 uses Panasonic’s Circular Polarizing technology to deliver market leading clarity with brightness displays of 1.200cd/m² and a very low reflection ratio on its touchscreen, 13.1” XGA display. The CF-31 also contains a floating mounted LCD design to protect from screen shocks. With magnesium alloy casing, inside and outside, and Panasonic’s anti-scratch coating, the CF-31 remains the toughest Toughbook to date. It is MIL-STD drop tested and has water, dust, vibration and temperature protection giving it an impressive IP65, MIL STD 810G rating. With HDD damping and rugged casing systems to optimise drop protection and an HDD heater and Panasonic’s foam packing system to provide flexible seals, the CF-31 can operate in even the harshest conditions. Adapting to fast changing circumstances is also an essential capability for a field device. The CF-31 comes with standard interfaces like 4 USB ports (USB 3.0 x 1, USB 2.0 x 3), HDMI and a serial port. Additionally the CF-31 offers a built-in configuration slot, which can be equipped with a 2nd LAN, FireWire or modem port on project basis. Other options such as a Smart Card Reader, Fingerprint Reader, GPS and webcam are also available. For security purposes, the CF-31 also comes with an enhanced Concealed Mode for use in mission critical environments. Using this feature, the Toughbook can go into “concealed mode” at the touch of a button by disabling the fan, backlight, status LED’s, speakers and communication (3G, W-LAN, Bluetooth) as specified. Panasonic today also announced major updates to its flagship semi-rugged notebook line, the Toughbook CF-53, offering mobile workers enhanced performance and flexibility. Panasonic and the 3rd generation Intel® Core™ technology have combined to deliver a semi-rugged notebook with improved CPU and graphic performance and a one-hour extended battery life. Ideal for light field working duties and business road warriors, the Toughbook CF-53 is the notebook for desktop-like performance with all day battery life and has the ability to take knocks and spills that leave conventional business notebooks for dead. The new Toughbook CF-53 includes the 3rd generation Intel® Core™ i5 Processor & Chipset. The high performance Intel® Core™ i5-3320M vPro™ (2.6GHz, up to 3.3GHz with Intel® Turbo Boost Technology) standard voltage processor with Intel® HD 4000 graphics, ensures the device is capable of handling the most intensive applications. As well as the new CPU, the CF-53 is also equipped with a low voltage DDR3L RAM module, using less power for more efficiency and a longer battery life. Hard Disk Drive capacity has been raised from 320GB to 500GB with 128GB, 256GB and 512GB SSD options available. The latest Panasonic and Intel® efficiencies combine to ensure the battery life of the Toughbook CF-53 has been extended by an hour, allowing mobile workers to work for up to 11 hours running on Windows® 7 without a recharge. An optional high capacity “road warrior” 9 cell / 87Wh battery can be chosen to ensure mobile workers can use the device all day long without recharge. Listening to customer requests, Panasonic has also added dedicated GPS and RFID options to the latest model. The GPS module is ideal for field workers who want to use GIS mapping applications to locate infrastructure assets in the field. The RFID option provides users with increased security options for accessing their device using two-factor authentication via contactless smartcards and pin. The Toughbook CF-53, with its in-built special carry handle, maintains all of the semi-rugged design features making it ideal for SOHO and SME business users or mobile workforces. With Toughbook’s durable features and semi-rugged product design, the CF-53 meets military standard criteria, meaning it can withstand drops of 76cm, vibration and even freezing temperature with optional heater-equipped HDD. The Toughbook CF-53 can easily handle the knocks and scrapes of everyday field working or road warrior life due to its magnesium casing, precision steel hinges and flexible mounted Tough-cushioned key components such as display, hard disk drive and water protected keyboard. In addition to the Standard Model, the CF-53 has two additional varieties. The Toughbook CF-53 Touchscreen model has been designed for people requiring a touch screen interface working outdoors in bright sunlight; utilizing a high brightness touch screen (up to 1.000nit) with circular polarizer to minimize sunlight reflection. The Toughbook CF-53 Automotive model has been designed to be used as a versatile tool for automotive research and development or workshop environments. With its optimized ports and double PC card slot the device can be customized to meet the requirements of technicians in many different roles. Both new Toughbook include the latest Bluetooth® 4.0 Smart Ready technology to connect mobile workers faster and more efficiently. Bluetooth® 4.0 (class 1) is fully compatible with Bluetooth® 2.1. Bluetooth® 4.0 Low Energy provides quick connection set-up and improved power consumption. In addition, both Toughbook come equipped with SuperSpeed USB 3.0 ports, enabling data transfer rates up to 10 times faster than Hi-Speed USB 2.0. Both devices also continue to offer an optional Ericsson F5521gw HSPA+ (DL: 21 Mbps) module with wireless ready connection manager. It includes a dedicated wireless switch allowing users to switch connections on and off to improve operating time. Available upon request, the device can also be switched into Anti-Theft-Protection mode by choosing the latest Intel® AT technology. 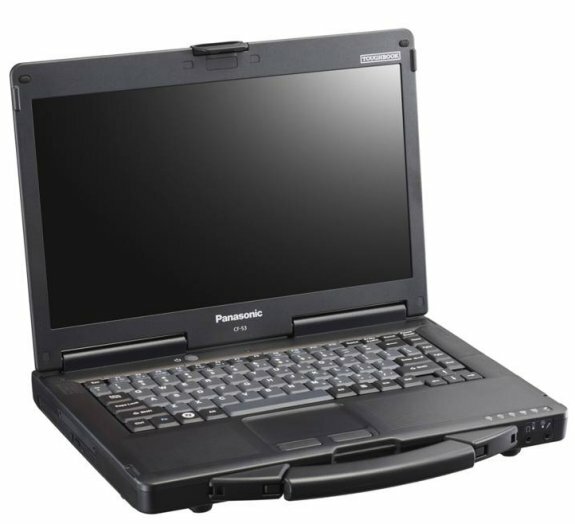 The Management Dashboard for Panasonic PC is included in the CF-31 and CF-53 Touchscreen model and is designed to simply and conveniently customize the Toughbook to the user’s preferred settings, providing a user-friendly quick launch interface. The Dashboard also allows easy management of the device using helpful tools, such as the popular Panasonic Power Plan extension Utility and PC Information Viewer utility. To ensure existing customers can continue to use the peripheral equipment, both devices remain compatible with almost all previous peripherals such as docking stations and batteries in order to provide long-term product lifecycle stability. The CF-31 range is available from July 2012, with the Standard model retailing at €3.699 MSRP (excluding vat). The CF-53 range is available from July 2012, starting at €1.544 MSRP (excluding vat).